Can you believe Spring is HERE? And with that comes Easter and boy does our community offer lots of family fun activities! Up until Easter Sunday, which falls on April 21st this year., let’s look at some of my absolute favorites in the area! Easter Bunny Prints! Let us turn those cute little hands into cute little Easter Bunny keepsakes. We do all the finish work, we only need their hand for five minutes. Price includes one hand print. Comes with a hole for hanging! **Due to high demand we are not allowing walk-ins, you must be pre-registered! All ages! **You must be pre-registered, we are not accepting walk-ins!! Hunt for eggs, visit the blue Easter Bunny, decorate a carrot cookie. Each egg hunter receives a free gift. No need to register. It's a special day at the farm when kids get to enjoy breakfast or lunch with our long-earred friend and then visit with him personally! To add to the fun, they'll be able to decorating cookies and have a chance to color a picture while enjoying a delicious breakfast or lunch. Food and beverages will be available to purchase for adults in the events room. Breakfast will conclude by 11:00 and lunch will conclude by 2:00. Call 412-835-3246 to make reservations. New this year: Prehistoric Eggs! Rediscover the most egg-cellent spring celebration in Pittsburgh! Grab your camera and hop on in for a parade with the Easter Bunny, a bird-themed egg hunt with an educational twist, story time with a live bird appearance, and more. Zoohop To Spring at the Pittsburgh Zoo- Friday, April 19, 2019 from 10am-1pmFree with Zoo admission. Take part in their Easter egg hunt All egg hunt participates will receive a complimentary bag filled with treats! Then, take a picture with the Easter Bunny, visit with onsite vendors, and participate in other activities throughout the Zoo. Make sure to bring your own basket. Do you know another great community event? Share in the comments!! 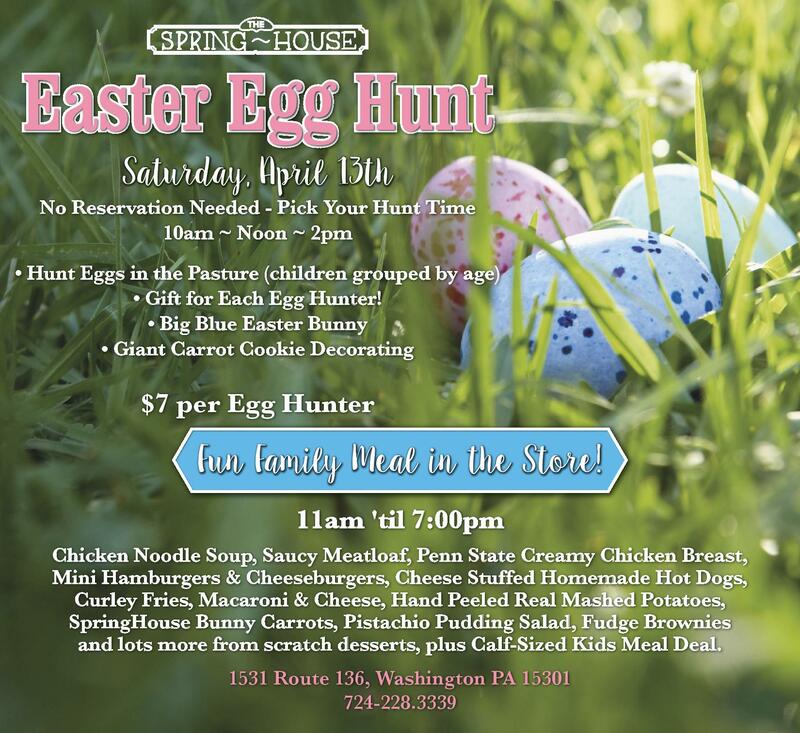 Don’t forget to check our your local township easter egg hunt as well!